Use the player below to listen to any episode of the podcast or scroll done to view the individual episodes. 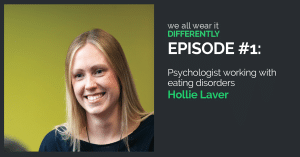 Hollie Laver is the Clinical Coordinator of the Barwon Health Eating Disorders Unit. She has over 7 years experience in mental health triage, crisis and continuing care treatment in adult and youth community mental health. Welcome to We All Wear it Differently. This is a welcome message and some background information about why I've started this podcast and what I'm hoping you'll all get out of it!